The individual with the sickle cell trait (Hb AS) is protected from sickle cell symptoms and complications by the presence as well of Hb A. He is largely protected from death caused by malaria, especially in early childhood, by the presence of Hb S.
Thus he enjoys the best of both worlds and is naturally better adapted to the malaria infested environment than the individual with the normal Hb AA who is more liable to childhood death from malaria, or the sickle cell affected one with Hb SS in whom malaria easily induces a lethal degree of anaemia. Hence, more persons with Hb AS survived to reproduce and pass the Hb S gene on to their progeny. 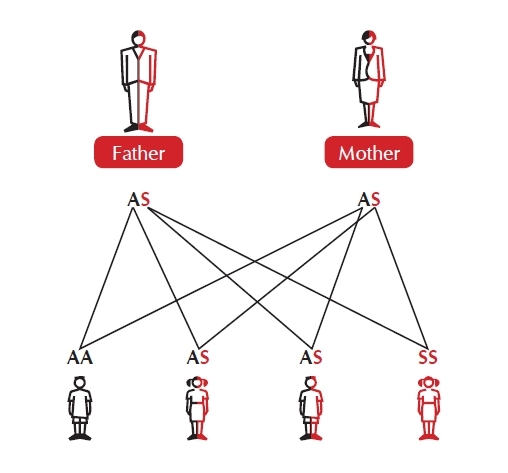 Thus, the prevalence of sickle trait (Hb AS) increased in each successive generation. Falciparum malaria therefore encouraged the expansion of the gene within the population by conferring on healthy carriers a selective survival advantage. Conversely, when populations emigrated to a non-endemic malaria zone the incidence of the Hb S gradually waned over many generations owing to the absence of the selective survival and reproductive advantage. This phenomenon is demonstrated in South Africa, in the West Indies and in the United States of America. While the Bantus in African countries north of the Zambesi River have a significant incidence of sickle cell disorder, the Bantus in temperate malaria-free South Africa have no significant incidence of SCD. They are reputed to have migrated to South Africa about 2,000 years ago and the prevalence of the sickle trait is less than 0.5% in their population. In African-Americans and African-West Indians ‘Who migrated relatively recently, only 300-400 years ago, the frequency of the sickle trait among them is 8% and 10% respectively.